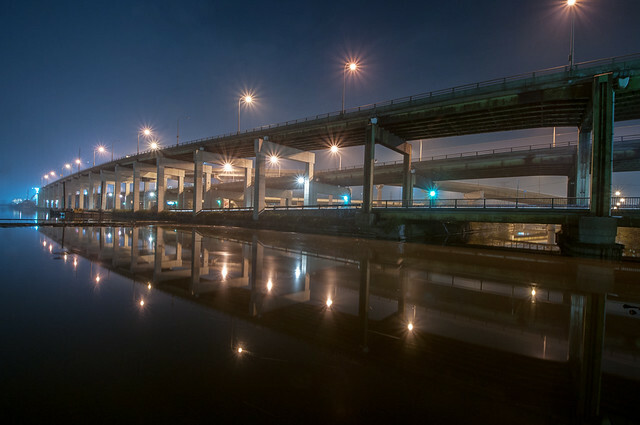 This week, Toronto city council will debate the fate of the Gardiner Expressway’s eastern section, a 1.7-kilometre segment of elevated highway from Jarvis Street to east of the Don Valley Parkway. The east Gardiner is in need of serious repairs, and a decision on what to do with it is required immediately. Approximately $342 million will be required to maintain the structure in a state of good repair, plus an additional $522 million in ongoing maintenance costs over the next 100 years (in 2013 dollars). The City is currently in a multi-year plan to rebuild the Gardiner west of Yonge Street, and there are no plans to remove or modify that part of the expressway. The 30-acre Unilever site, on the east side of the Don River, was recently acquired by First Gulf, a large commercial developer. The site is part of a larger 60-acre master plan that would create 12 million square feet of office and retail, creating thousands of new jobs. Access to the site is limited due to the elevated Gardiner Expressway east of the Don River; developers have been pushing for either the east Gardiner’s removal or a new “hybrid” expressway that would improve access and visibility. And finally, Waterfront Toronto has plans to re-naturalize the mouth of the Don River at a cost of more than $900 million. Transportation infrastructure in the area must be modified to accommodate this work, which will address Don River flooding and unlock future residential and commercial development in the Port Lands. It’s worth noting that Toronto has been down this road before. In June 1999, city council voted 44-8 to demolish the eastern section of the Gardiner Expressway between Logan Avenue and Leslie Street, an under-utilized segment of highway built to connect to the unbuilt Scarborough Expressway. While some city councillors fought the decision to remove it, that 1.3-kilometre section of highway came down in 2000 and 2001. It was replaced by a wider Lake Shore Boulevard, along with a new multi-use trail. The traffic jams predicted by opponents of the demolition plans never materialized. In 2014, City staff and the environmental assessment consultants first recommended the remove option, replacing the six-lane Gardiner east of Jarvis Street with an eight-lane Lake Shore Boulevard. This is one of two serious options under consideration by city council. But after feedback from the public works and infrastructure committee (PWIC) and First Gulf, there were two options carried forward for further public review: the remove/boulevard option, and a new “hybrid” option that would maintain most of the existing expressway. Both would allow First Gulf to redevelop its property for commercial redevelopment. The hybrid option maintains the Gardiner as-is west of Cherry Street, with new off-ramps to Lake Shore Boulevard east of Cherry and fly-over ramps to the DVP, elevated. It would cost $414 million in up-front capital costs, and $505 million in maintenance over a 100-year life cycle. While travel times will increase regardless of whether the hybrid or removal option is chosen, peak traffic times would increase two to three minutes with the removal option. New ramps would be constructed near Cherry Street, and only the short section of the existing expressway, the ramps leading down to Lake Shore Boulevard near Logan Avenue, would be removed. There would be some new pedestrian amenities near Keating Channel. Calling this option a hybrid is disingenuous, as it pretty much preserves the status quo. For the most part, the pedestrian experience isn’t improved, auto capacity remains the same, and it’s the most expensive of the options on the table. Supporters of the hybrid include the Gardiner Coalition, which includes the Canadian Automobile Association (which promoted freeway expansion in Toronto before), the Canadian Courier & Logistics Association, the Ontario Trucking Association, Redpath Sugar, and the Toronto Industry Network. The coalition of motorists and industry commissioned a separate study written by the University of Toronto’s Transportation Research Institute that claimed travel times would increase by 10 minutes. As of Friday, an estimated 19 councillors, plus Mayor Tory, were in support of the hybrid option. The remove option results in the demolition of the Gardiner from Jarvis Street eastward, replacing it with an eight-lane Lake Shore Boulevard. There would be signalized at-grade intersections at Jarvis, Sherbourne, Parliament, and Cherry Streets (with more intersections possible as the East Harbourfront lands develop), and new flyover ramps connecting the widened Lake Shore Boulevard with the Don Valley Parkway. The removal option is the least expensive; it would cost $326 million in up-front capital costs (demolition and the construction of new ramps) and $135 million in ongoing maintenance over a 100-year life cycle. The study’s traffic models claim that removal would only increase travel times by three to five minutes. The remove option unlocks additional publicly owned lands for redevelopment, which could be sold for between $100 million and $150 million, and a group of 14 developers signed a letter on Friday arguing this option was best to unlock further development. Other supporters of the plan include former mayor David Crombie, Ryerson president Sheldon Levy, the City’s medical officer of health, and every living former chief city planner (and current chief planner Jennifer Keesmaat). As of Friday, 16 councillors support the remove option.